We were thrilled to welcome Laura Schwartz-Muller and Cliff Muller, the dynamic partners behind Los Angeles’s preeminent design/build team, Four Point Design Build, into our showroom during the January 2019 Las Vegas Market. 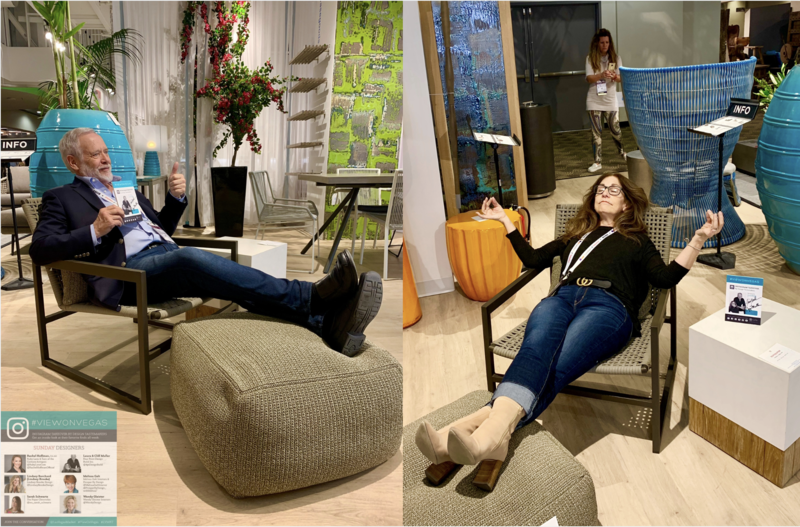 Laura and Cliff were chosen as part of Las Vegas Market’s #ViewOnVegas Instagram takeover team and we were honored to have them visit our showroom. 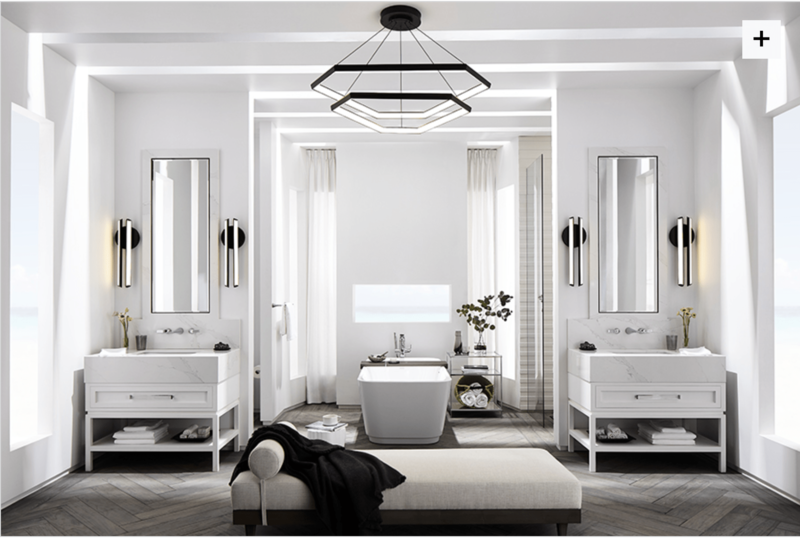 For our readers not familiar with LA based Four Point Design Build, here’s a stunning bathroom Laura and Cliff just completed in a brand collaboration partnership with luxury bathroom brand, DXV, a division of American Standard, now being featured in major national magazines Elle Decor, Architectural Digest, etc. We had a wonderful market, and we want to thank each and everyone of you, whether first time visitors like Cliff and Laura or our long time wonderful customers who came to visit us. We hope you all enjoyed a healthy bite to eat in our Seasonal Living Cafe, and we appreciate you shopping with us for your clients, stores and showrooms. 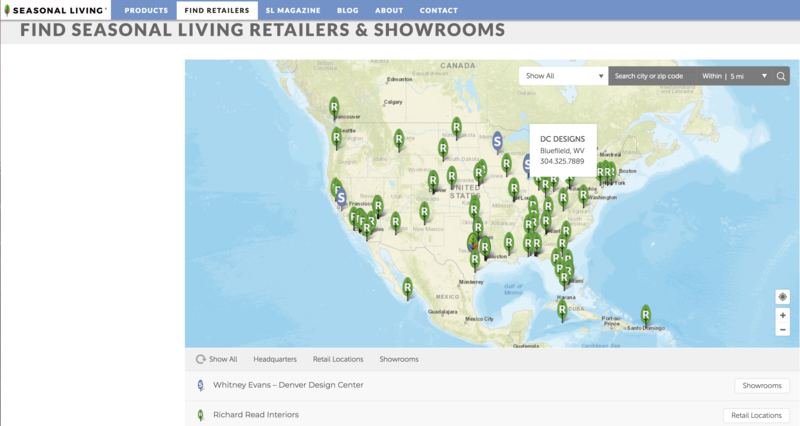 If you are reading this and would like to locate one of our retailers, showrooms or interior designer partners to inquire about buying one of our indoor outdoor products for your home or resort property, please click > here < to see our retailer locator on our website, a screenshot image of which is shown below, to find our partner closest to you. In the past year, we’ve introduced over 150 new products, both within our existing collections: FIZZ, EXPLORER, PERPETUAL, and CERAMICS and within our brand new collections, ARCHIPELAGO, KAKABAN and INGOT. 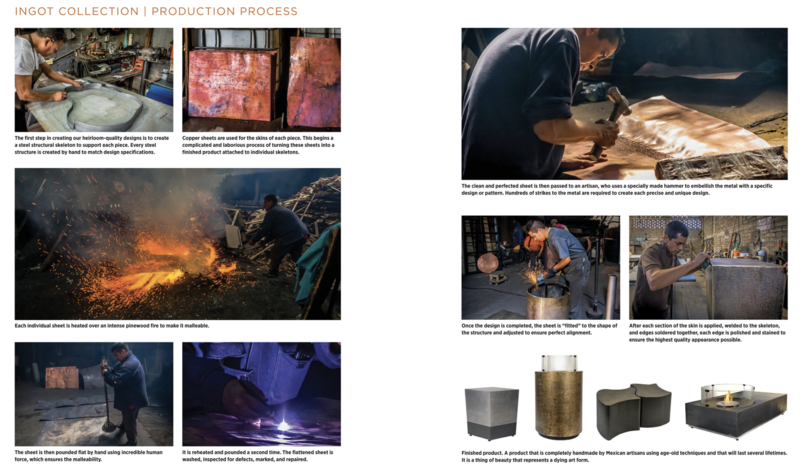 One of our most popular new introductions has been our hand hammered INGOT cocktail tables (available both with and without fires) and pedestal fires, made by individual artisans out of sheets of copper who have been practicing their craft for generations. See their process by scrolling down. One thing to be aware of with our new INGOT fires: they require you to use Super Bio Fuel, available only from www.luminaproducts.com (a totally separate company in which we have no financial interest.). At checkout, use our discount code — SEASONAL_LIVING_FUEL_10 — for a 10% discount. 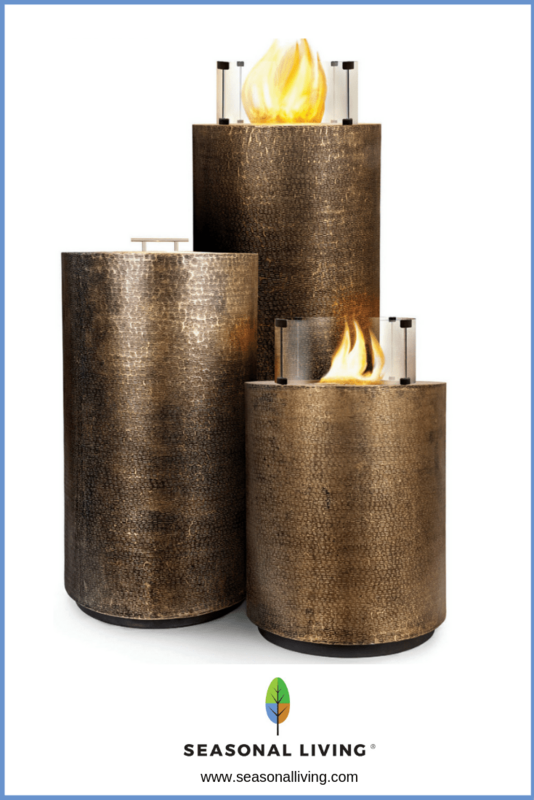 WARNING: Please do not use ethanol or any other types of liquid fuels in our INGOT Collection fire tables and pedestal fires, other than SUPER BIO FUEL from LUMINA PRODUCTS. Use of other fuel types may result in damage to your table. 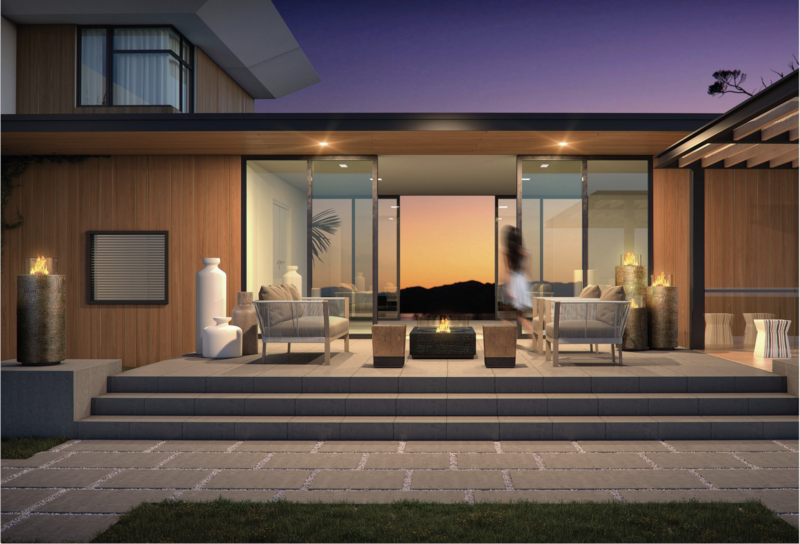 Can you imagine yourself in this setting, being warmed by the radiant heat our INGOT fires give off, enjoying a beautiful evening with your friends? 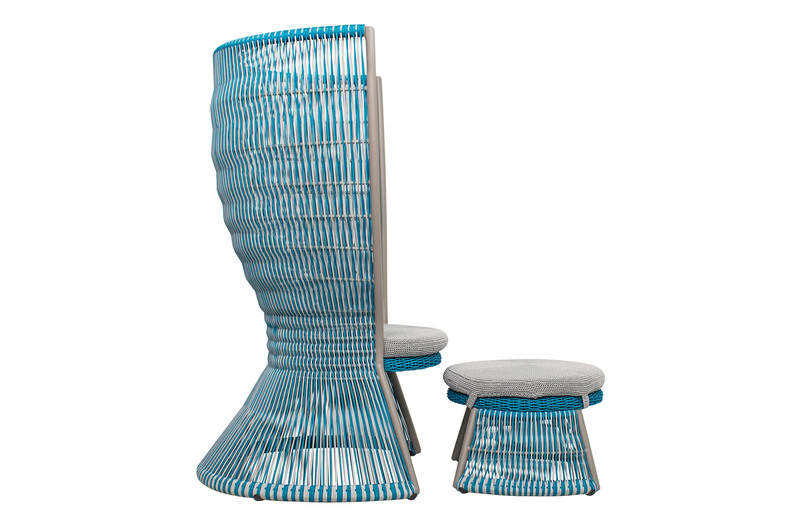 Another popular new introduction has been our ARCHIPELAGO collection that we first wrote about here, and this market we introduced our NICOBAR chair and ottoman (already available in dark grey) in a beautiful aegean turquoise blue that was very well received by our retail partners. 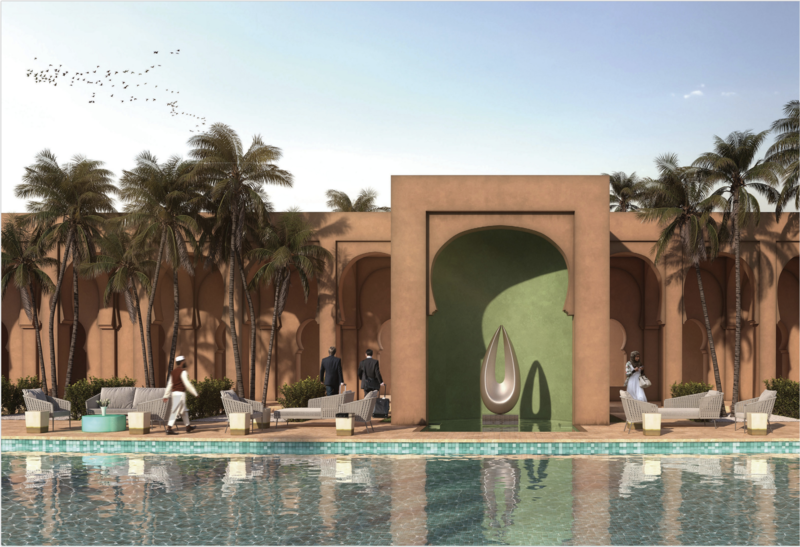 We could easily see several of our large scale NICOBAR chair and ottomans in a resort hospitality setting with our new large scale ELLIPTICAL vase, shown below. 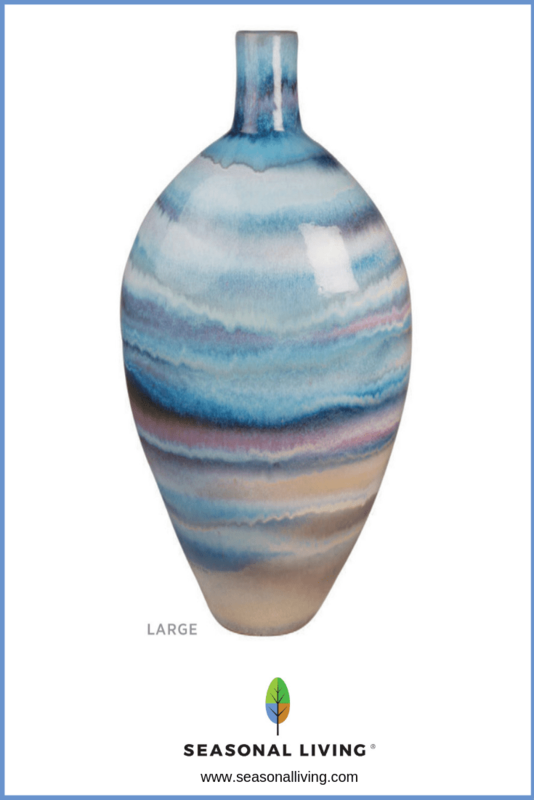 Click > here for specifications on this gorgeous new addition to our indoor outdoor CERAMIC VASES Collection. 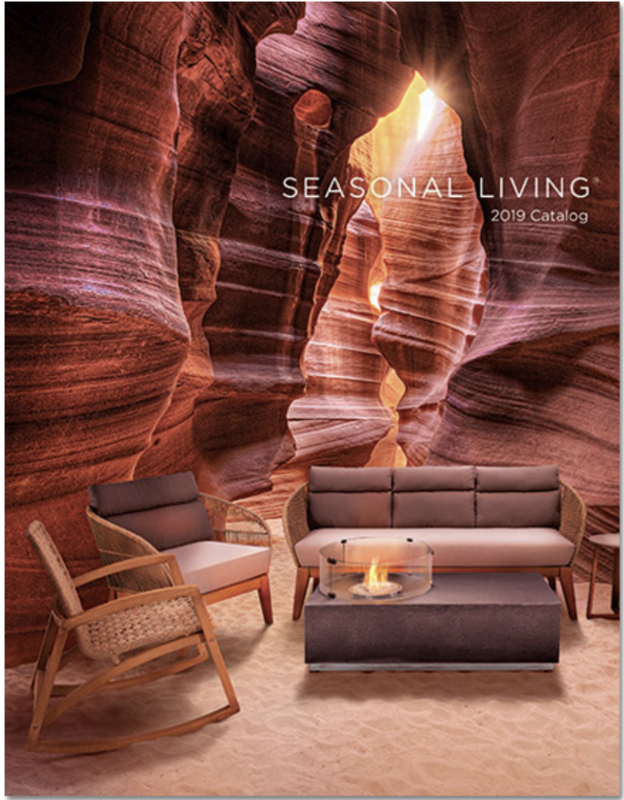 In addition to the excitement of preparing for and welcoming our visitors to our first big market of 2019, we also just finished re-designing and launching our 2019 online product catalog which features our new FUEGO sub collection on the cover against the stunning backdrop of Antelope Canyon. FUEGO is part of our popularly priced EXPLORER Collection series and you can learn more about this collection by clicking here. Did you know Antelope Canyon – located in Page, Arizona – is sacred Navajo land and you cannot visit it without a native Navajo Indian as your tour guide? 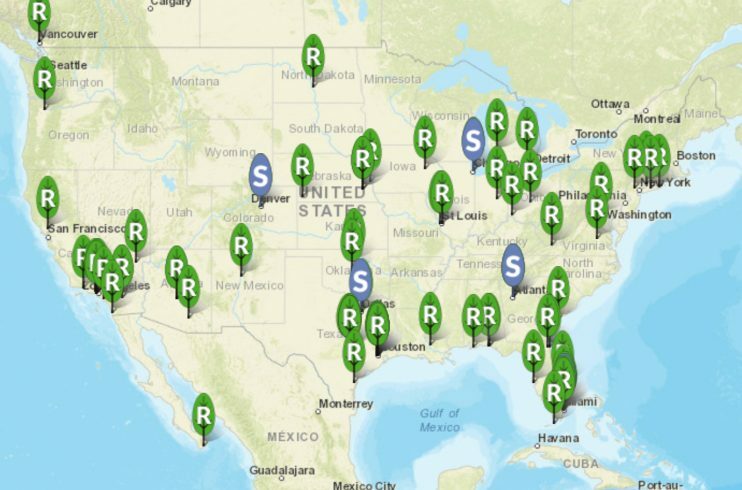 If you or your family are planning on going this spring or summer, book your tour by clicking here. 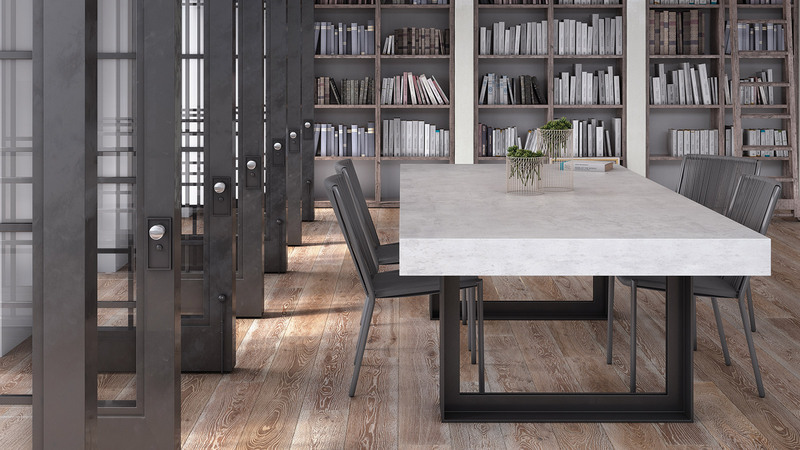 One last new introduction we’ll share with you that has been extremely popular is our new SENZA lightweight concrete table, available in lengths of 118″ or 87″ (custom sizes for quantity orders are available on request), with the top available in either ivory white or light grey. The bases are metal suitable for indoor/outdoor use. This is from our PERPETUAL Collection series of lightweight concrete tables, which have always been available with reclaimed teak bases, as well. Here is the SENZA as seen in our new online catalog. NOTE: Concrete tables require special care to prevent them from staining, and we ship a bottle of sealant with every order. This sealant will need to be reapplied regularly and it’s always important, even after your table has been sealed, to wipe up stains immediately to keep the surface from permanently staining. Click here to see a short video we’ve prepared so you can see exactly how to seal and care for your Seasonal Living lightweight concrete table surfaces. One other thing to note in taking care of your indoor outdoor furniture? Covering it if it will be subjected to extreme cold. Almost all of our lines, with the exception of our ETNA line of volcanic stone tables, needs to be covered if it will be subjected to freezing cold temperatures. MAXIMUM PROTECTION: They feature heavy duty 100% 600D Oxford fabric. 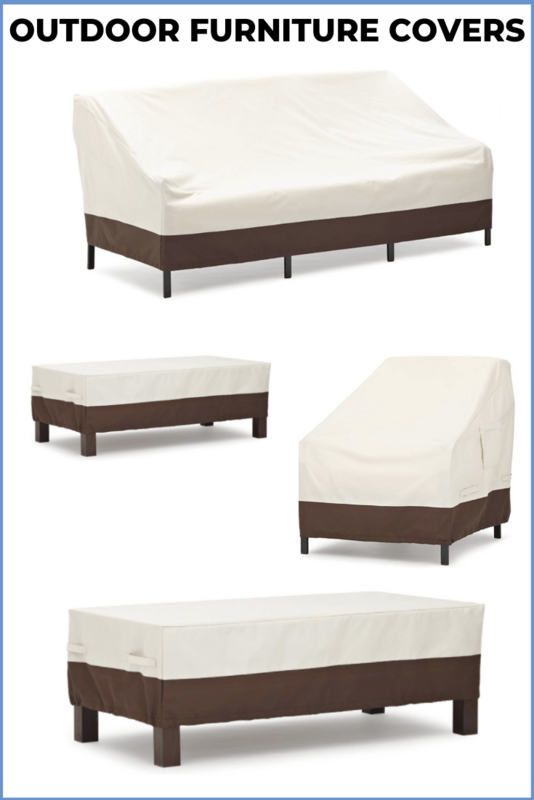 WATERPROOF: The oxford fabric has an added UV-stabilized & water-resistant coating and a water-resistant laminated backing which could prevent water from seeping through the cover and keeps your outdoor furniture dry and ready to use. ADJUSTABLE CORD LOCK CLOSURE: The elastic hem cord with toggles allows adjustment for a tight custom fit. The adjustable belted hem with click-close straps provides a customizable fit with exceptional security in the windiest conditions. EASY TO USE: The large padded handles make removal of these covers easy, while air vents reduce inside condensation and wind lofting. Purchase the sofa cover by clicking > here, the chair cover here, the cocktail table cover here, and the dining table cover here. 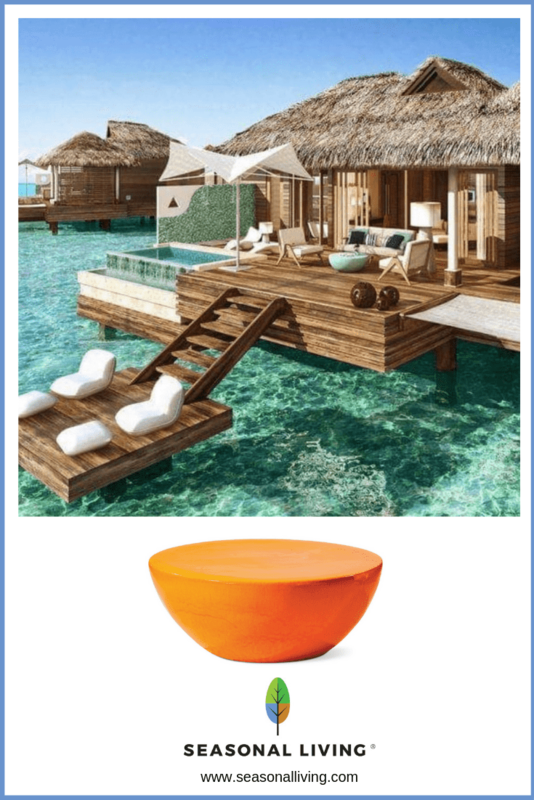 We were excited recently to see our BOWNESS ceramic table (available in several colors and in custom colors for quantity orders) and our INDA cordless LED lighting featured in an outdoor setting at this very famous resort in the Maldive Islands. If you’ve used any of our furniture in your own resort hospitality work or within your own homes, we’d love for you to share images with us by emailing them to us at editor@seasonalliving.com or tagging our Instagram feed with @seasonal_living_trd. Speaking of Instagram…. we’ve just started adding STORIES to our Instagram feed and invite you to watch for them in the circles above your Instagram username – for the latest Seasonal Living updates! 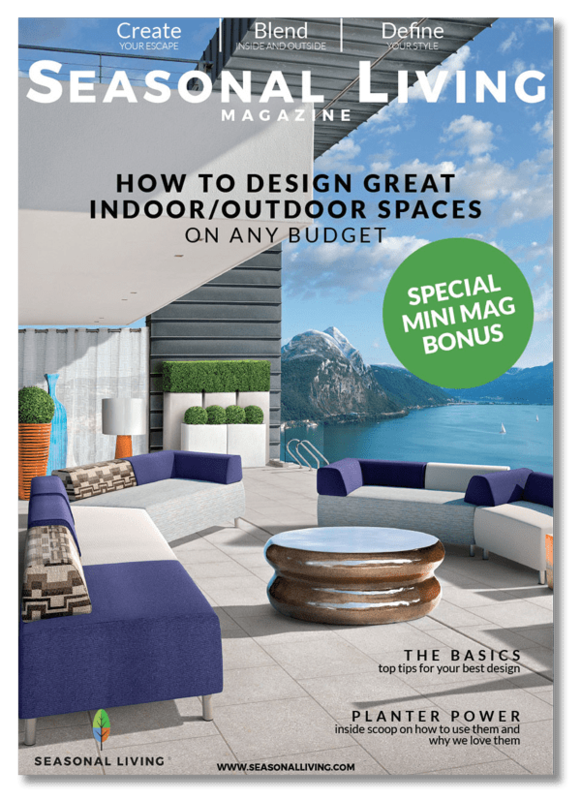 *How To Create A Beautiful Indoor Outdoor Room on Any Budget* as an immediate download! 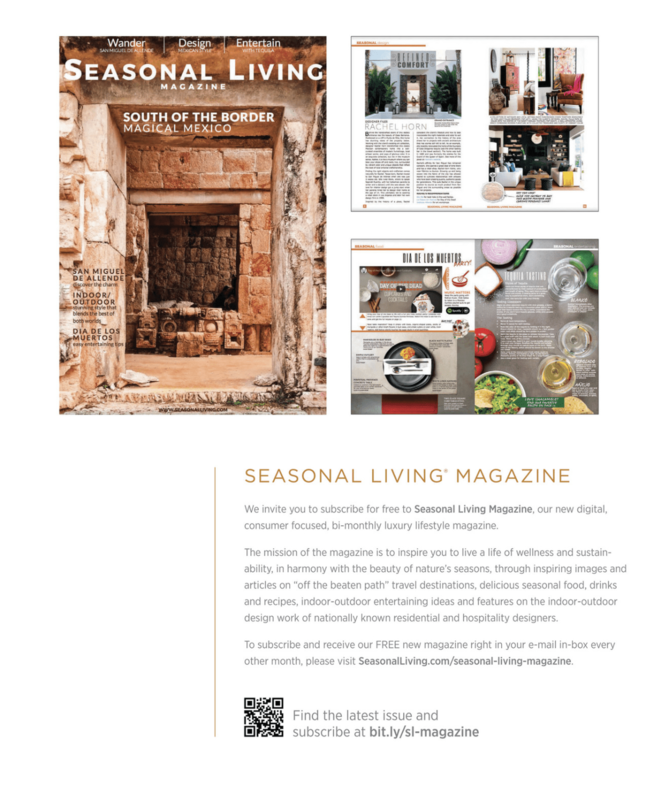 This spread below is an image from inside the second issue of Seasonal Living Magazine, now featured in our new online product catalog. 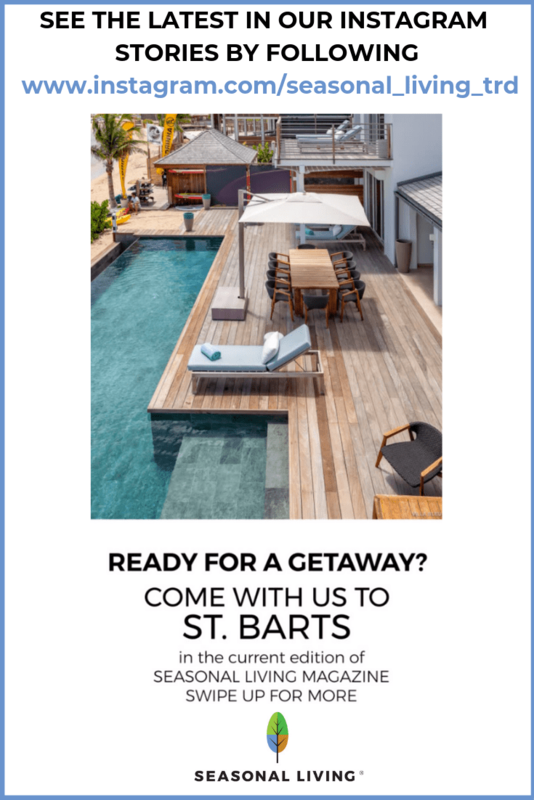 FYI: If you missed our last issue, featuring the stunning indoor outdoor design work of St. Barts based interior designer Elisa Bally and well known Carribbean luxury hospitality designer Stephanie Tyler of Studio IDC, read all about it on our post here. 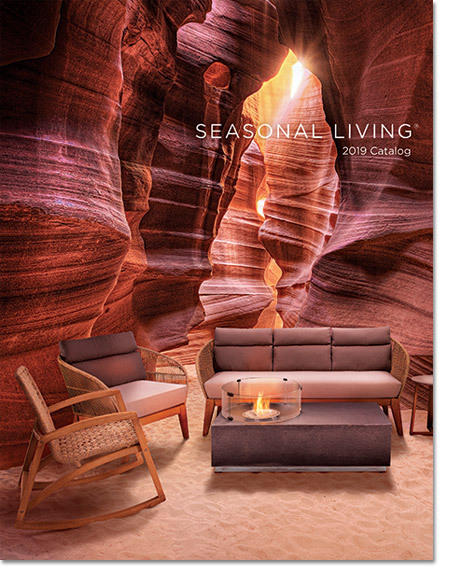 Lastly, this image from our 2019 online product catalog featuring our new ANTILLES indoor outdoor furniture collection with its comfortable chaise lounge, a part of our ARCHIPELAGO Collection series, hints at where we’ll be taking you in the next issue of Seasonal Living Magazine, out February 15th. Can you guess? Don’t miss seeing it first! Have it come right to your inbox by subscribing here. As always, thank you for taking a bit of your time to read our blog, we greatly appreciate it. If you’re a homeowner or resort developer reading this, we hope our new collections have you dreaming of how you can use Seasonal Living’s indoor outdoor furniture to design your own indoor outdoor living areas, and if you’re one of our customers reading this, we look forward to seeing you next at Spring #HPMKT, in Interhall, beginning April 5th! This entry was posted in SL Blog and tagged best concrete outdoor furniture, best designer resources for indoor outdoor furniture, best indoor outdoor furniture, best luxury indoor outdoor furniture, best luxury outdoor furniture, best outdoor furniture, how to take care of concrete furniture, Seasonal Living, seasonal living magazine. Bookmark the permalink. ← St. Barts: A Caribbean Holiday Getaway!